We are talking Crypto here at Global From Asia. I know – some of you feel it is all scams – but there are legitimate projects and initiatives happening. By you subscribing and listening today I assume you like and trust us here at GFA – so hear us out. Blockchain will be a game changer more than the internet has been for the world. There may be a delay, just like the Web 1.0 and then Web 2.0, etc – it will come in waves. But there are some promising projects that are out to help the cross border business and ecommerce industry. And that is what we are watching for. We want to keep you updated on what is happening in the crypto space that is relevant to the cross border industry. 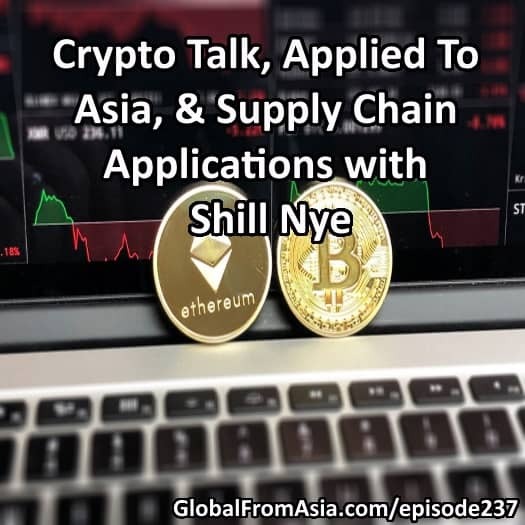 Today’s guest is great, Shill Nye, and we have also our Crypto influencer on the GFA team, Evan, talking about what is working and what isn’t in crypto today, with a sprinkle of Asia in it. Enjoy! You seem to be traveling a lot. What do you think of traveling as a crypto influencer. Does it add more perspective, more value? You know, you meet different people. You used to be anonymous online, but now you have unmasked yourself. What made you decide to wear a mask in the first place? What made you decide to ultimately reveal yourself? What is your sentiment on the crypto market today? I know this might be a very difficult question especially for people who intend to give honest answers… but based on current circumstances when do you think we might have the next rally? You were tweeting about Temco ICO. What do you think of it? There are quite a number of Supply Chain Management ICOs do you think TEMCO has an advantage? Asia as a hotspot for Crypto? Which cryptocurrency are you the most bullish on besides Bitcoin? Thank you Shill, and Evan. Also great to have Luisa on helping with getting the show started and finished. We have been doubling down on even more amazing content for everyone. We are almost 5 years at Global From Asia and want to make an even bigger impact on the world and industry. So if you enjoyed what we have been covering – you will enjoy it even more soon! I’m a newbie to e-commerce, and binge-listening to this podcast has given me the knoewledge and confidence to take the plunge! Having located to Hong Kong a year ago, this podcast has really helped me in understanding the business world in Hong Kong and China. Thanks so much!! If you enjoyed this episode, leave a positive review on iTunes, & more (directions here)!